Last year’s conference took the association across the Irish sea for the third time in our history. After meeting up at the Psychology Department at Trinity College, Dublin for lunch, and having a visit to the research facilities of the department’s electrophysiological and behavioural laboratories, we travelled by train to Waterford during the afternoon. 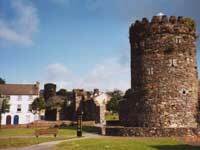 We stayed at the Tower Hotel which is by the estuary of the River Suir and old city defences. The programme of events included a presentation by Ken Tabb from The University of Hertfordshire on MAC OS X operating system, the transition to the Euro by Patrick Holohan, sharing with us the problems associated with changing one’s currency that may well affect us in the future in the UK. Several companies were also present including Lafayette Equipment and Linton Instrumentation that demonstrated psychological equipment and software developments using Psychological tests. Rosemary Westley presented a talk on functional magnetic resonance imaging that is in use at RHUL and aspects on Health and Safety using the equipment. Another talk was also given by Robert Jones on the student bio-pack system. The conference also allowed time to visit the cultural centre of Waterford with its medieval city walls, its colourful pubs, craft shops, local Glass Factory and to visit the home of Apple computers in Cork.